Make yourself at home in one of the 114 air-conditioned guestrooms. Complimentary wireless Internet access keeps you connected, and cable programming is available for your entertainment. Bathrooms with shower/tub combinations are provided. 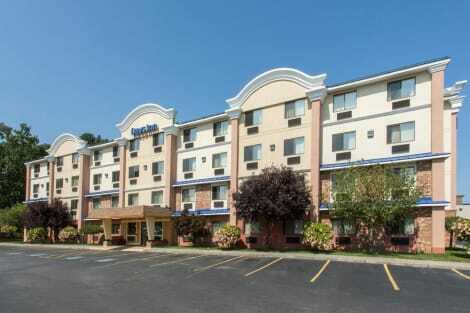 Located in Leominster, Days Inn by Wyndham Leominster/Fitchburg Area is within a 10-minute drive of The Mall at Whitney Field and Johnny Appleseed Visitor Center. This motel is 9.6 mi (15.4 km) from Wachusett Mountain Ski Area and 3.6 mi (5.9 km) from Fitchburg Art Museum. lastminute.com has a fantastic range of hotels in Leominster, with everything from cheap hotels to luxurious five star accommodation available. We like to live up to our last minute name so remember you can book any one of our excellent Leominster hotels up until midnight and stay the same night.